Are you ready to be a Ninja Warrior of the Night? If you are a Shinobi with cunning this game is perfect for you! This Ninja is here to help you win via skills of this martial artist who wants you to WIN BIG! In stealthy silence, the Ninja jumps reels to offer 4,096 ways to win up to 10,000 x stakes. Authentic in feel, this thrilling online slot feels abundant with espionage and sabotage. You will love feeling the way of the Ninja, he is bound only by the orders you give him and to complete his mission successfully right here at Wizard. With experience and passion, Red Tiger are well qualified in bringing the crème de la crème of innovative games to the player, and they have an abundance of player experiences to choose from. 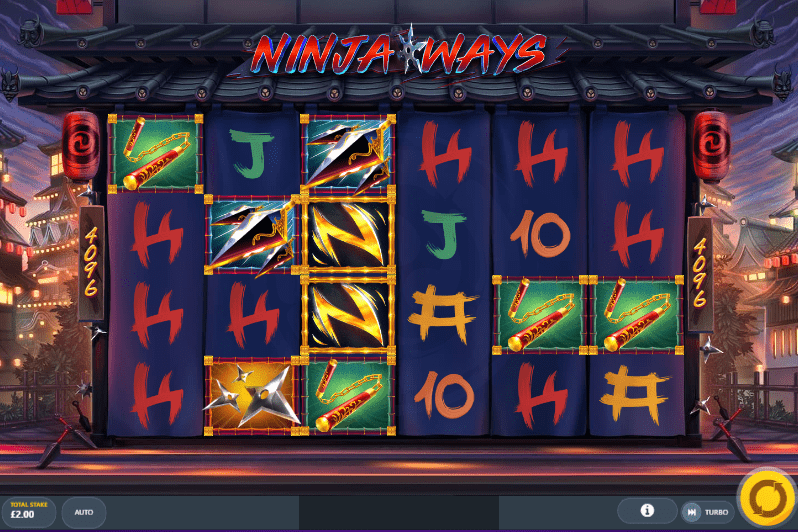 An advanced UK casino game, Ninja Ways has six reels, four rows and 4,096 ways to win. Three random reel modifiers and wild substitutions, together with 50 free spins, make up the main features. This game can be played on: Smartphone, Mini Games, Desktop, Tablet, TV, iOS/Android Apps. This is one of the best UK slot online with so much mobility offered to players! Subtle Japanese music is punctuated with Ninja cries and the reels contain nine pay symbols, one scatter icon and one wild icon. The premium symbols or icons of value include nunchakus, shuriken, kunai, and ‘N’. 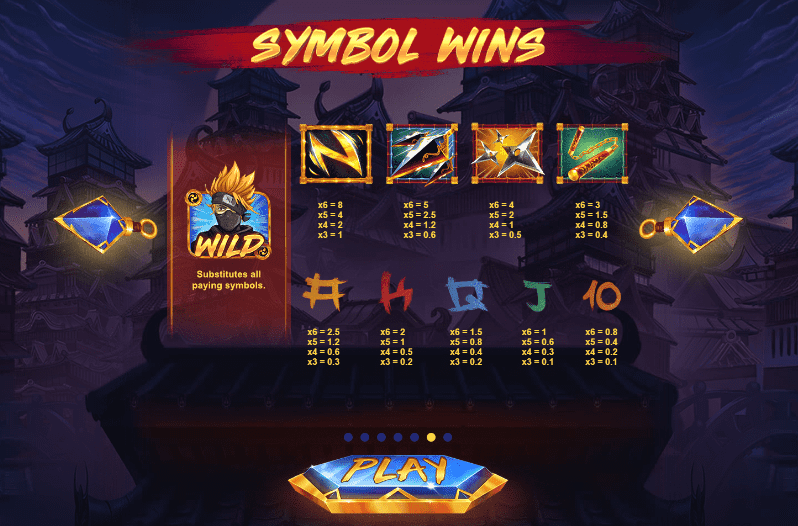 Scatter symbols can appear stacked on all reels, if you hit a five scatters from left to right in one spin, this will trigger the Ninja Spins bonus. There are three random features, they are Ninja Doors, Ninja Wild and Ninja Ways, which guarantee a win each time. If you activate the Ninja Doors, you will see a Mystery Door being placed randomly on the reels. The Ninja Wild will allow the Ninja to leave on or more special wilds on random positions on reels. The Ninja Ways feature will allow the Ninja to leap across the screen placing identical pay symbols on the screen. Ninja Ways leaps on to your screen with stealth and covert cunning. The Red Tiger team have once again produced an absorbing slot online game, with martial arts induced visuals. This game engages the player and has a very high hit rate so that you can be certain that when the Ninja leaps across reels with all the cunning he can muster, rewards in abundance will follow! If you enjoyed Ninja Ways, why not try Who Wants To Be A Millionaire?